Our legs were sore for the next couple of days, and we couldn't get rid of volcanic dirt properly no matter how many times we took a shower. It almost seemed that our adventure of hiking Concepcion Volcano did not want to be forgotten that easily. Since we put Nicaragua on our list of countries we wanted to visit in Central America, one activity stood out in particular. We aspired to hike to the top of Concepcion Volcano which dominates the skyline of Ometepe Island. If you prefer spending your time actively, we recommend you to put this activity on your bucket list of things to do in Central America. Yes, it is tough but doable, and memories of hiking Concepcion Volcano will for sure be one of the most vivid ones which will last forever. Here you can read everything you might want to know before hiking Concepcion Volcano. Concepcion is together with Maderas one of two volcanoes forming Ometepe Island in Nicaragua which lies in the middle of the largest lake of Central America, Nicaragua Lake. Concepcion is an active volcano which erupted last time in 2010. It is 1610 meters high (the second highest volcano in the country), so considering that Moyogalpa lies approximately 300 meters above sea level, you can foresee that you have a pretty tough hike ahead. We started our day early in the morning with breakfast in our hostel, and our guide picked us up before 7 AM. The transport to the start and from the end of the trek was supposed to be included, so what a surprise that without a single word we were heading to a bus stop and waited for a bus. When the bus arrived, I, Martin and two Canadian girls jumped on, our guide paid on our behalf and off we went. We got off the bus at the sign saying Concepcion Volcano, paid our fees, and started the trek. The first part of the trail, approximately two kilometers walks on a flat and dusty path, and it was pretty easy. Once we reached the base of the volcano, the trail became more narrow and much steeper. There are some steps on and off, tree roots, but mostly the trail is covered in black soil which can be slippery at times. Before the trek, we did not know there are two official ways how to reach the summit, but the one we did (the classic one), is supposedly a bit easier as the bigger part of an ascend walks in the forest, so we were not exposed to the sun for that long. The sun in Nicaragua is too strong and exhausting, and every piece of shade was a relief. Once the jungle section finished (after probably two kilometers), we entered the exposed part where it was too sunny and too windy for the rest of the hike uphill. From this point, the path became steeper, and also the surface changed from slippery soil to volcanic rocks. At some points, we had to crawl up and use hands in order to keep on the trail, but it was nothing too challenging - we believe that any medium trained person should be able to get to the top. And after four hours, we finally reached the top of the volcano and could have enjoyed beautiful views of the crater, Maderas Volcano in the distance, and views over the lake. We were lucky that day as the volcano was not covered in clouds, and although it was a bit hazy and the wind was blowing (it is always windy on the top, wind gusts can be quite strong, so bring wind jacket and walk carefully), we had a great time on Concepcion Volcano. After we soaked in the view and had a snack on the top, it was time to get back. It was not very entertaining to walk back as rocks were slippery, and all of us fell down several times before we reached the base of the volcano. Our legs were sore as sometimes it is even harder to descend, and it was quite challenging mentally to stay persistent and keep going, but after another four hours, we reached the main road, where this time a van was waiting for us and took us back to Moyogalpa. After a shower when we had to wash down all the dirt from ourselves and our clothes, we headed for well-deserved dinner. We should not probably pride ourselves that we ordered two meals each and ate it in record time. Hiking to Concepcion Volcano takes anything between six and ten hours return, depending not only on your level of fitness but also on the speed and level of fitness of people in your group. It took us eight hours to finish the climb, but the other two girls in our group were slower than us and wanted to stop every ten minutes or so when going uphill, so we had to wait all the time. It is not any quicker to get back from the volcano, so for example if the hike up takes you three hours, be prepared that return time will be about the same, as the trail is rocky and slippery, and you will be walking slow. The total distance is 12 kilometers. At the moment, it is forbidden to hike Concepcion Volcano on own without a guide for travelers' safety. We hired a guide through a hostel where we stayed, and it was four of us hiking that day with him. He did not speak English at all (we did not require an English speaking one), and his only task was basically to lead us to the top and back. The path is not hard to follow even on the rocky part close to the volcano's top, and we believe that we would have made to the summit without a guide, but we did not have a reason why not to obey Nicaraguan rules. We paid only $15 per person (without an admission fee, but with a transport), but note that we visited the country less than a year after huge protests when tourism was only recovering, and prices were lower than usual. It is possible that prices will rise once the situation will calm down. Also, if you wish to have a more knowledgeable guide, not only a person who will show you the way, be prepared to pay more. We met only one person hiking the volcano that day without a guide, and our guide stopped him and tried to explain that hiring a guide is compulsory - you can be fined when caught, but we are not sure who would actually enforce the punishment. The entrance fee to climb Concepcion Volcano is $3 or 100 cordobas, and it is usually not included in the tour price. Make sure you have the exact amount as the money collector did not seem to have change. 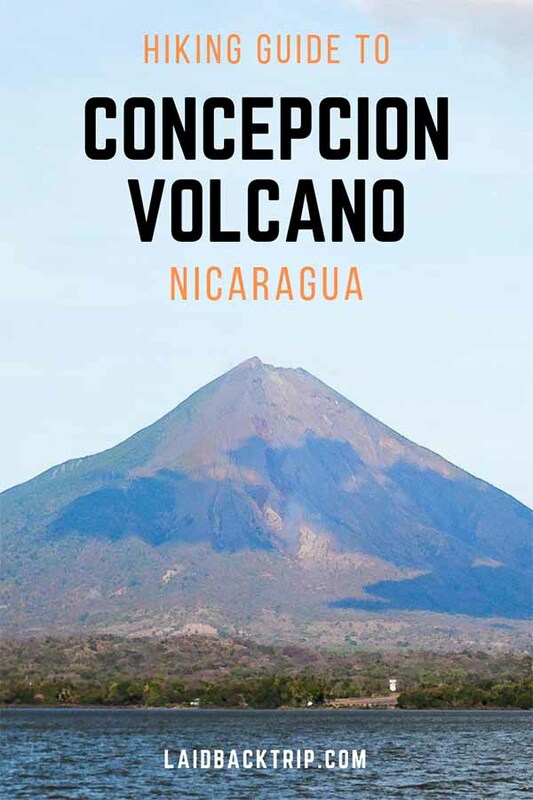 Generally, weather in Nicaragua is hot and humid with two distinct seasons - wet and dry. Although it is hard to predict the weather, one thing is guaranteed - it is going to be bloody windy up there. You should wear shorts and a short-sleeved t-shirt, hat, sunscreen, and sturdy shoes, but pack with you also a rain poncho, windproof jacket, long trousers, lots of water (we had 7 liters for both of us and drank it all!) and a snack. Ometepe island consists of several small towns and villages, and you can, for example, stay either in Moyogalpa, the main center of the island where the ferry arrives and a place where you can easily arrange tours or rent a scooter, or you can base yourself in Santa Cruz, be closer to Volcan Maderas and enjoy the laidback atmosphere of Nicaraguan volcanic island. We also met quite a few people who spent a couple of days in Moyogalpa and then traveled and slept in different towns on the island. We've handpicked some of the best accommodations on the island for every budget. Budget | Hostel Los Abuelos - Super cheap hostel in Moyogalpa close to the port has both, private rooms and dormitories, and features free wifi, garden, shared lounge and kitchen. It is a steal for the money. Mid-range | Eco-Lodge El Porvenir - A rustic accommodation in Santa Cruz has pretty rooms and amazing views of Maderas Volcano. Luxury | Totoco Eco-Lodge - Spacious rooms, friendly and helpful staff, and chiefly outdoor pool overlooking the volcano are the main reasons why to stay in this hotel in Balgue. The only way how to get to Ometepe island is by a ferry from San Jorge. No matter from which destination are you traveling to Ometepe Island, the high chance is that you will arrive in Rivas from either San Juan del Sur, colonial town Granada or directly from Costa Rica (Read our guide: How to cross the borders from Costa Rica to Nicaragua). From Rivas, you can take a public bus to San Jorge, which is not that frequent as you might think (and does not stop at the bus station but on the road bypassing the terminal) and costs 10 cordobas. If you don't want to wait for a bus, you can take a shared taxi for 30 cordobas per person. Once you arrive in the port, you need to pay a tourist tax which is 33 cordobas, and then you can proceed to the ticket office and buy a ferry ticket for 50 cordobas. The ferry runs frequently throughout a day approximately every hour or every hour and a half, and the ride takes one hour.